Many may not know that I am oddly a fan of raspberry wheat beers. Perhaps it is because some of my first introductions to craft beer were fruit beers such as Thomas Kempers Weizenberry, Widmers Widberry, and Pyramids Apricot Ale. For some time I worked in Beaverton Oregon and rarely made it in to the Racoon Lodge which is the original location of Cascade Brewing. Only but a couple of years ago did I actually first try their Razberry Wheat. I drank it, I loved it, and I reviewed it with stellar marks. So far to date, I feel Cascade Brewings Razberry Wheat is a very underrated raspberry wheat ale. 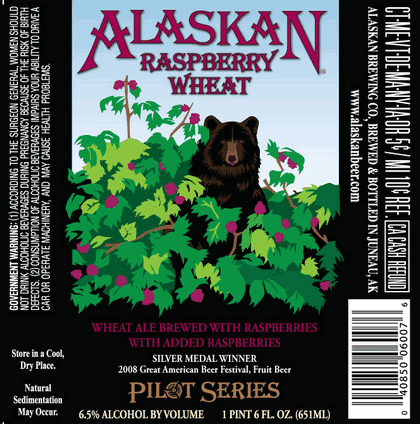 I was kind of shocked to see Alaskan Brewing release an actual bottled version of the beer. I was also quite shocked at the price I paid for the 22 oz. bomber. It was pretty much $9. Let's see how it holds up, live, as I review it. I figure I will do the dirty work before many of you decide to take the dive and buy it. It is getting much more difficult these days to spend that kind of money on a beer for many. What can make a beer make the consumer swerve off track to try something new? My excuse of always wanting to try something new isn't good enough for the current market. This bottle is the second one I have had from what I believe has been the second release of their Pilot Series program. I really am a big fan of the imperial IPA that was released, and have sat back thinking about how underrated it really has been. - Pours a murky cloudy copper and browned fluid. Much like a rich amber has been tainted with the juices of a red fruit. The while fingers of head really stuck around a bit, and have left a thin foamy layer steadily about in my cheater pint. Appears to be ready to make some lace. - Light fresh, crisp, and fruity raspberry aromas. Like holding your nose right up to a freshly picked raspberry as the hairs between the fruits tickle your nose. Light brown sugar sweetness and thin caramel nose. I am really looking forward to the gulp. 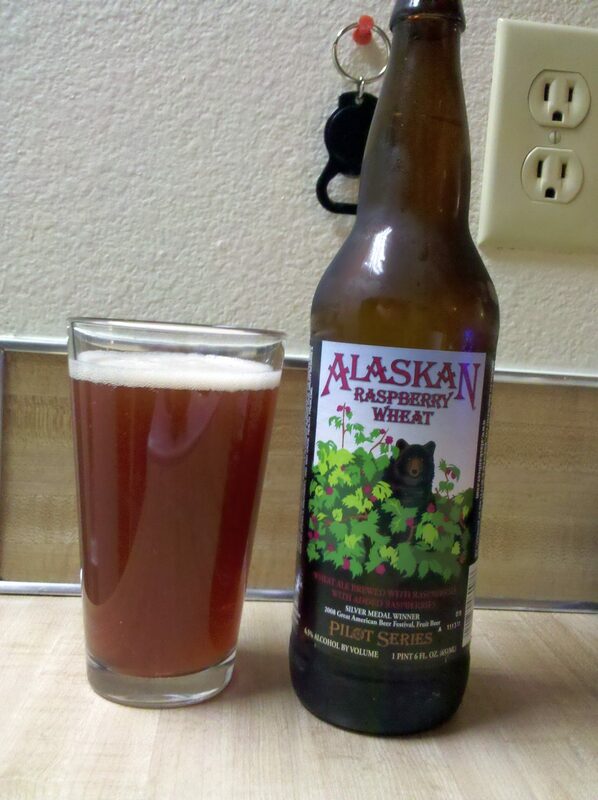 - Nice earthy wheat malt backdrop with a subtle raspberry blanket across the tongue. There are certainly some bitter hops at play here. Grassy, piney, and a bit like dry herbs. Zest balances in between a rather mild wheat malt and subtle sweet fruitiness. There seems to be a healthy amount of wheat which is nice, and a surprisingly healthy dose of bittering hops. The raspberry sits nicely within, which is odd since they played such a role in the nose. Doesn't quite hold up to my expectations though. Bit of a tartness to it as well afterwards. - Well carbonated.. almost too much for this style of beer. Medium to light bodied, and a bit chewy. Tartness keeps the palate watering. Bit chalky from the blandness of the malt. Not so bad, but average compared to my expectations. - For me it's tough comparing such a beer to others of its equal style. But this one fell slightly short for my expectations. It is still a very solid brew, but for the price (which doesn't reflect my score) I should have been able to acquire a 6-pack of the same thing. It's nice to see such a brew from Alaskan down here in Vancouver, WA at a Whole Foods, but I just can't say "Go out and try it!". It's solid, but nothing to rave about.